Please enter your email to view this guide. 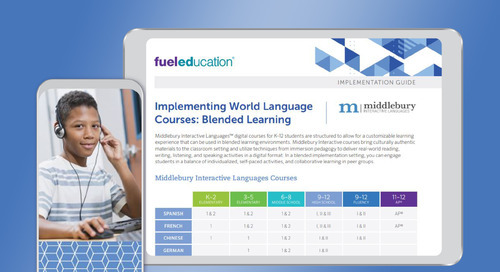 Download this implementation guide bundle to learn more about all the different models of online courses FuelEd can offer your school or district. Download this guide to learn about multiple successful ways to implement world language learning into your learning programs. Download this guide to learn about multiple successful ways to implement English language learning into your learning programs. Read about how to implement the rewards-based learning solution, Stride, to your learning program with this implementation guide. Use this as a step-by-step guide to implementing online credit recovery solutions in your school or district. Read this guide to learn how to implement credit recovery solutions into your learning program. Learn about how to implement FuelEd online courses in a flex setting with this implementation guide. Learn about how to implement online courses in a rotation model or flipped model with this implementation guide. Learn about how to implement FuelEd online courses in an enriched virtual setting with this implementation guide. Learn about how to implement à la carte online courses with this implementation guide. Read this guide for implementing an extended English language learning curriculum into your learning program. Read this guide for implementing a pull-out English language learning curriculum into your learning program.